When you have to tune up or adjust your table saw, a dial indicator will help do the job. Dial indicators measure dimensional differences as small as .001". You just need a way to mount it. Here I will show you how to build this jig and show you three important ways you can use it for your tablesaw. 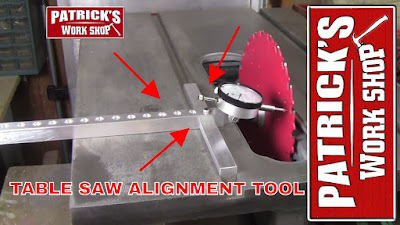 There are a lot of good tools and ways check your table saw alignment, check out Patrick's Workshop-How to Align a Table Saw he gives a good explanation and demonstration. In his previous video he even shows you how to build it. Here is the Dial indicator and base I made years ago. This one is used for moving the fence micro adjustments. It works just great but I want it to do more so I will show you how to make it with a few modifications so it will be even better. Purchasing via these links helps support my channel. Oak will be used for the jig and since it is a hardwood it will be durable and last long in the shop. I just cut a few pieces to L 5.8"x W 2.7 " The height will be 1.25". After the two pieces are glued together I use a 2 1/2" forstner bit to cut the circle, this size will be fine for the dial indicator. The hole is drilled 0.65" deep. A slot will be cut 4.6" in length for the spindle and stem. Special measurements are taken to make sure the slot is the right width and depth. The width should be the a tiny bit smaller than the stem of the dial indicator since it will be a pressure fit. The best way to make the length cut is to use a stop block. Make a test cut and move the block a small amount at a time until you get the right length cut. I make a pencil mark on the fence each time I move the block for a reference. One end is slightly tapered this will sit nice on the table saw and make it easier for viewing. Make sure you cut it before glueing the runner. In the video I cut it after I glued on the runner. This way worked out but was a bit harder to cut. A small Forstner bit is used to clean out the slot. Also the center of the hole can be drilled out for the back post on the dial indicator. Now the dial indicator can be placed in the circle. One more small hole has to be drilled out and this is for the thumbscrew. When it is at the right position it is marked and placed back in the vise and drilled out. Here you can see a runner that has been glued on. It does not have to be secured with screws, two pieces of wood glued together are very difficult to take apart. A 3/4" forstner bit is used to drill another hole, this will be for the magnet. Gorilla glue is used for the magnet. I have done this a few times and have had good results. Two coats of Varathane were applied and we are just about done. The dial indicator stem is pressed into the front slot. I used the end of a screwdriver and swedged it in. I did this to the one I made many years ago and it has never moved. If ever you want to remove it just take a small flat screwdriver and pry it out and then use the screwdriver to put it back. I won't go into the fine details to do each task at this time but micro adjusting your fence is easy enough to figure out and use right away. Making jigs to help you in your shop is very rewarding, and if it works well and has more than one use that is even better. This is an easy jig to make and will help you make fine adjustments to your tablesaw blade and fence. Cutting the bevel on one side makes it easier for viewing and the one magnet works fine. It does not have to be strong for the tool to work properly. 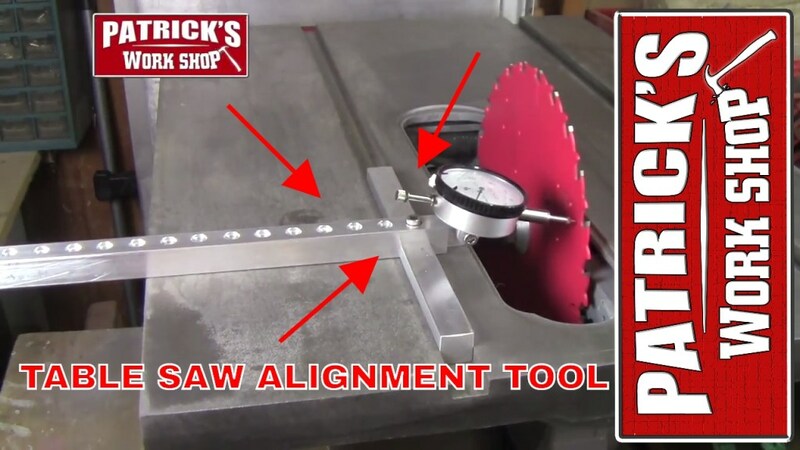 This tool will help you with your table saw adjustments and then help you make more precise cuts. How do you align or adjust your table saw? Best Fence Service provider came through again. He could add additional fencing towards the previous fencing he or she installed. The cost was really reasonable; also it was done quickly as well as professionally. He works with your routine to obtain everything done rapidly. If you need fencing done, don't hesitate to contact Best Fencing Contractor and the groups click.